Here are some of the Native American baskets I have collected. 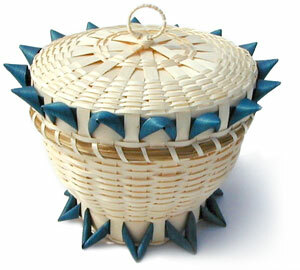 I have also included a few baskets of my own that were inspired by Native American designs and styles. 5" x 5 to 7" x 7"
I am not sure of the origin of this basket form or the reason for the name other than I guess they do sort of look like an acorn with a foot or base. 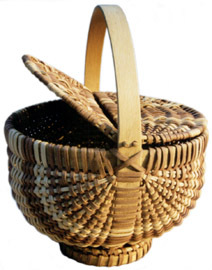 I have a number of these baskets in a variety of sizes, with a variety of curl shape and pattern. I even have one that doesn't have a lid, but is made into a pin cushion with a green velvet cover. 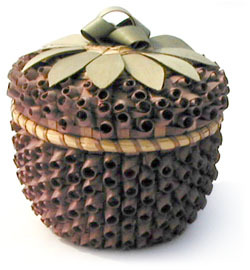 There are baskets that are shaped just like an acorn from an oak tree and you can see one I made at the bottom of the page. I have always seen these baskets described as tourist's baskets. I have recently discovered that this information is far from correct. Here is what Nick Clark, president of the National Center for Great Lakes Native American Culture, has to say, "The Strawberry Basket is made for and given to new-born babies and it is a treasure kept through their entire life and taken with them to the Spirit World. 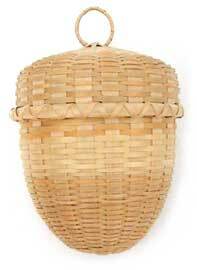 A piece of their umbilical cord is kept in the basket along with other things of special meaning so the ancestors will recognize them when the arrive in the Spirit World. In the Algonquian languages, the word for heart (as in human heart) and strawberry are almost always the same. Therefore, the strawberry has great significance to our People. In our stories of what happens after death, we speak of going to the Spirit World where our families greet us with the first fruit, the strawberry." 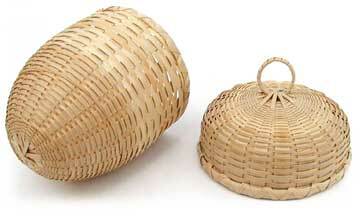 The basket on the left is an antique Cherokee Indian basket woven of white oak. 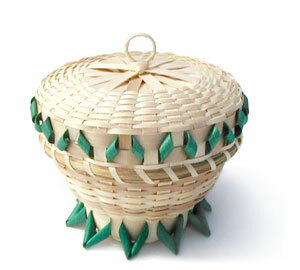 The type of hinge used for the double lid and the use of color are the strong indicators of the basket's origin. My parents have a number of baskets like this in their collection, both with and without lids, all using color and having a similar type of "foot". The basket on the right is my version using commercially available supplies. 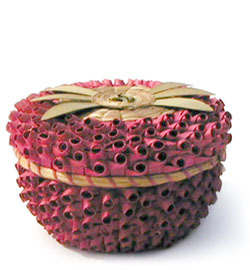 It is woven of flat reed over a frame of round and oval/oval ribs. 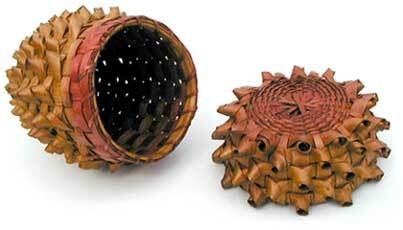 The rims for the basket had to be soaked and reshaped to match the proportions of the original. 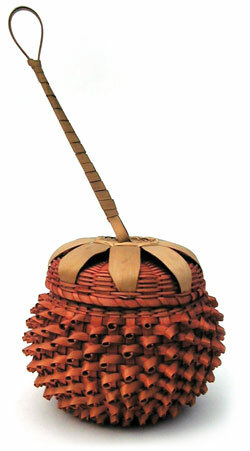 A very unique figural basket made to resemble a pinecone. 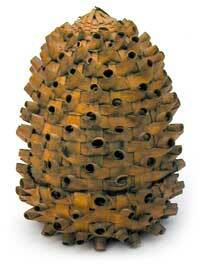 It is woven of ash and covered in porcupine curls. Even the rim of the lid is covered in curls so that when in place the lid is virtually invisible. 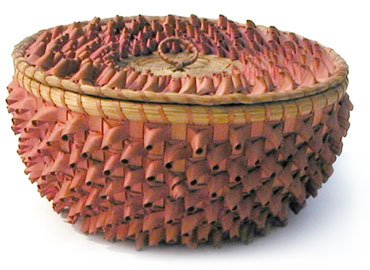 The original red dye can be seen under rim and on the lid since the basket sits upon its top. 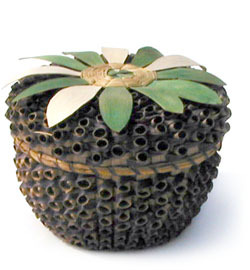 A fairly common figural basket is the acorn. 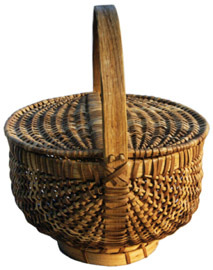 The design was often used for yarn baskets where a small hole would be made in the top of the basket so that a skein of yarn could be placed inside and the tail threaded though the top hole in the basket. This basket I wove myself out of brown ash. 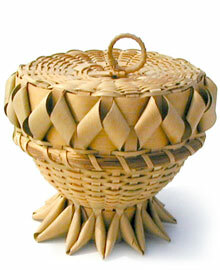 Often times this type of basket will be woven of braided sweetgrass.